Born in Nigeria and raised in Bermondsey, rapper Flohio sees herself as a bridge between two cultures. We’re at a shoot in an industrial complex in south east London – a stone’s throw away from the housing estate the 25-year-old rapper grew up on – to talk about cultural pride and identity in the run up to the World Cup. 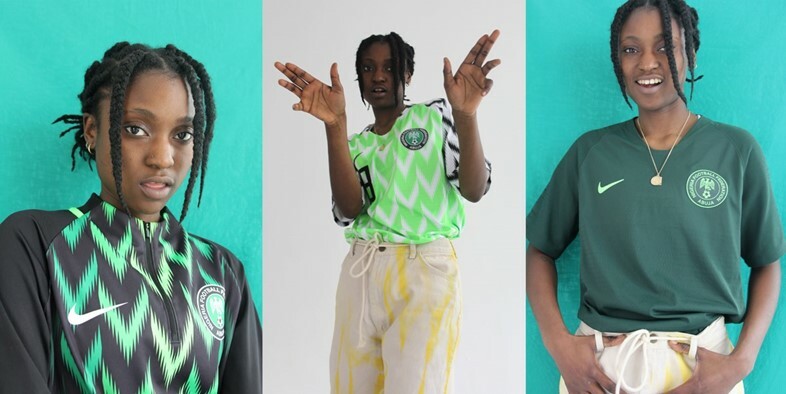 When Nigeria play against England in a friendly on Saturday, June 2, she says she'll support whoever is winning – but she’ll be wearing the Nigerian Nike jersey she’s been modelling all afternoon regardless. “I represent half and half, and rep both always”, she says proudly. The music she makes is undeniably homegrown. You can hear the inner city acerbity in her quick-witted boasts in her recent single “Bands”, the industrial soundscape on records like “Fights”, and her London twang in the homage to her home in “SE16” (the latter two both collaborations with production duo God Colony). As one of London’s fastest rising names, she’s been hotly tipped to blow up by the likes of Naomi Campbell, with her kinetic live shows earning a raucous reputation in the city. 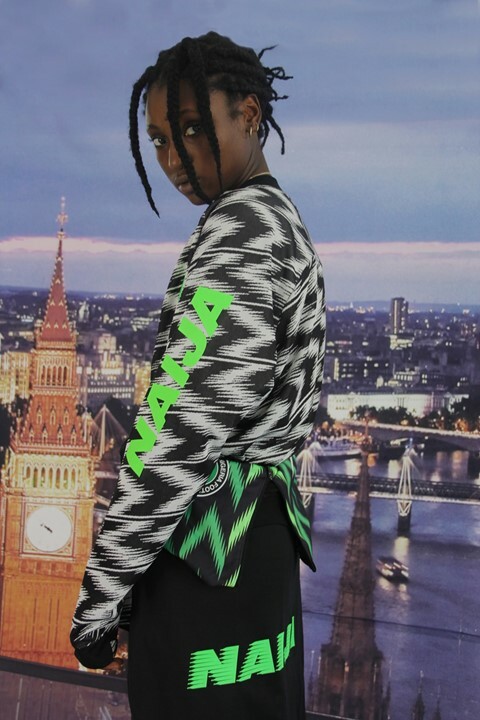 The influences of Nigeria are also ever-present in Flohio’s life. She moved to England at eight years old from Nigeria, and her Lagosian lineage stayed alive through her mother’s cooking of native dishes, her ability to speak Yoruba, and her stage name, a portmanteau of her Nigerian name: “I’m Funmi Ohiosumah, but my initials are FL Ohio,” she explains. Here, she tells Dazed about her pride in her identity and her unique style. Do you remember the Nigeria vs. England World Cup match when we were kids? If that game happened tomorrow, who would you back, what kit would you wear? Flohio: Well, who is winning? (laughs) Nah, regardless of the England flags everywhere, I’d be the one walking round my estate in the new Nigerian kit, no one better bad me up. I’ll wear it with my chest. It actually says Naija on the chest – that’s our own thing we’ve said for a long time, so if you know, you know. The way the fabric is designed looks like African attire, our love of prints, and the colours of the flag. It’s very loud – it’s heavy. I’ll be wearing it watching the game in the Wetherspoons down the road. Big up Spoons (laughs). Flohio: I feel home at Bermondsey, because that is where my mind opened up. I was introduced to new perspectives, new sounds, it’s where I feel comfortable, and where I go for a release. I draw so much energy from the place because I know myself when I’m there. I don’t have to always look behind my back or over my shoulder. Even when I have enough money to get my own place, or move out or relocate I will still stay in there – I might move closer to Surrey Quays though (laughs). How important is it to you to rep both of your cultures? Flohio: Sometimes people in similar positions feel like a lost tribe, we need something to hold on to. But you don’t have to choose either, you can be both. Listen, I am blacker than black, so my heritage shows anyway. I do want to learn more though. There are little customs and cultures that make you feel more connected, like for example if you know how to speak Yoruba. Flohio: I know Yoruba, but that’s just the surface, you know? I wanna know more about the Gods, who my people were worshipping before it was taken away. It would make me a more powerful human being to be rooted in that deep knowledge of where we were at, to walk with my head high and truly know who we were. You can see the same sentiment in a lot of British-Nigerian work right now. Flohio: Before, when people thought of Africans, they weren’t the cool kids or the cool things coming out. Now it’s changing. We’re in a new age now, and there’s a new generation of creatives that are going wild and don’t care. They’re not conforming to anything – they just want to do them, and that’s so sick. The new African diaspora – I’m a part of that, you are, Ruth (Ossai, the photographer at the shoot) is. I’m trying to amplify this and take it back to Naij. I want to meet Nigerian creatives and because over here or in America there’s a light, it’s so much easier to showcase your work and talent. How do you see yourself doing that when you go back? Flohio: Well, I think to connect with your heritage you have to want to invest in little things – like making internet widely available, little things to really push things forward so we can share ideas. What next for you in terms of music and creativity, how is all this going to manifest in your work? Flohio: It’s something I am constantly doing and is evident on my next record. I’m constantly finding myself. Never stop looking for yourself.